Is that an LRIP price? What is the FRP price as determined by a contract? Pounds are fungible according to other criteria. On the plus side they make 15% of every F-35 apparently as well as the lift fan, ECM, ejector seat etc. The cost is high because they bought earlier lots but that will come down in time with later lots. More importantly the F-35B is ready for trials when the QE carrier is ready which wouldn't have happened if they had gone for catapults and F-35C. hythelday wrote: Oh my, British Bs are 150M£ apiece now? That's likely the Gross Weapon System Cost (to include simulators, etc) with spares & weapons thrown in to make it even higher. Partners pay exactly the same as the US so it's easy just to look at the Budget and get the numbers. Last edited by SpudmanWP on 31 Oct 2017, 16:59, edited 1 time in total. ....consider the source of the article, the gas turbine drive for the QE also cost 150M£, as well. The UK should buy the B and be happy with it..
Can't see them flying and fighting in the C. The Falklands should at least give them some comfort in STOVL types, especially in the BVR dynamic vs. non STOVL types. Fully expect it to hit 200 million when it hits Sunday evening news. 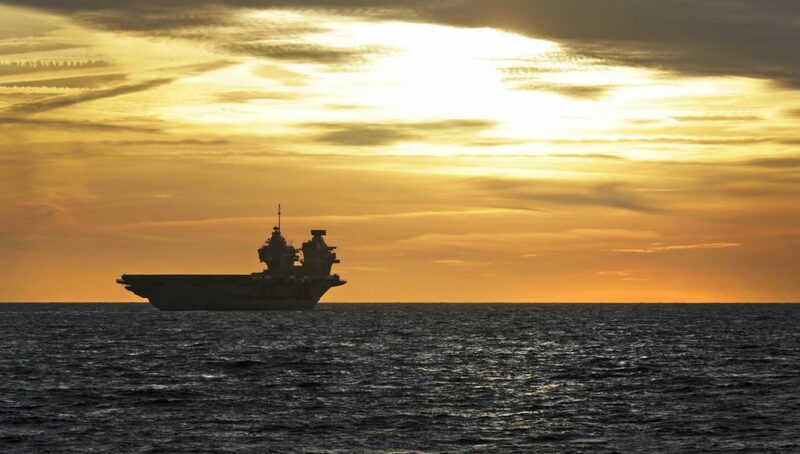 The commander of HMS Queen Elizabeth, Britain's new aircraft carrier, would like to see US Marine Corps F-35Bs and V-22s embark for up to nine months at a time once the warship becomes operational. "We'll certainly see some footprint aboard the ship. The big question is do they deploy with us much longer term in the future, maybe for six, seven, eight, nine months from when we deploy. That's what I would love to see," Capt. Jerry Kyd said. Confirmation that the Royal Navy's 70,000-ton aircraft carrier force would embark US Marine Corps (USMC) F-35Bs came during a meeting between UK Defence Secretary Michael Fallon and his US counterpart, Ash Carter, in London at the start of September. Fallon said that eventually British aircraft could be deployed on US aircraft carriers. The Queen Elizabeth is currently in the final stage of construction ahead of sea trials, which are expected to get underway in the spring of next year. A second carrier, the Prince of Wales, is about two years behind the construction schedule for the first of class. If all goes to plan, Queen Elizabeth is expected to start fixed-wing flight trials with three British F-35Bs off the east coast of the US at the end of the summer of 2018. Helicopter flight trials with the Merlin and Chinook are scheduled to take place earlier in the year. Kyd, Britain’s most experienced aircraft carrier captain, said USMC aircraft could embark soon after the F-35B flight trials were complete. "The US has been across and looked at the carriers very closely. They seem to like what they find and they understand that making this happen is relatively easy. Now, whether they embark in 2018 I don’t know, its probably a bit too early, but certainly soon after," Kyd said during a briefing with reporters at the Rosyth shipyard in Scotland where the two carriers are being assembled by the BAE Systems-led Aircraft Carrier Alliance. "The strategic expectation is the USMC will embark with regularity from 2019/2020," he said. The opportunity to deploy USMC F-35s on the Royal Navy warship has in part been triggered by Britain’s inability to fund the acquisition of sufficient aircraft to provide a credible strike force in the years immediately following the introduction into service of the Queen Elizabeth. Kyd admitted few British jets would be available for the first operational deployment, but he said no decision had yet been made about the final number. "We are constrained by the F-35 buy rate even though that was accelerated in Strategic Defence and Security Review (SDSR) in 2015, so initial operating capability numbers in 2020 are going to be very modest indeed. We will flesh it out with helicopters, and a lot depends on how many USMC F-35s come on our first deployment in 2021. But by 2023 we are committed to 24 UK jets onboard and after that it’s too far away [to say]," he said. "The numbers depend on the buildup, world events and how many aircraft we keep on the training squadron side that are declared front line. But to give you an idea, the Strategic Defence and Security Review in 2015 made a declaration of 24 UK aircraft — two front line squadrons — would be available to go to sea in 2023. "Why wouldn’t we want to progress interoperability with our closest ally when we have spare capacity, spare space? To me as a naval officer the answer is fairly obvious," he said. "There will be a stepped approach to that but we have not decided the actual numbers for the December 2020 initial operating capability, or, indeed, the first deployment in 2021." The British F-35B force is being shared with the Royal Air Force, which will use it as a strike jet alongside the Eurofighter Typhoon. The Conservative government committed to buying 138 F-35s in the 2015 SDSR but didn’t give a date to fulfill a pledge many people here think is unlikely to be met anyway. The British are buying their F-35B piecemeal. To date they have ordered eight aircraft, of which five have been delivered. A further batch of aircraft are expected to be ordered soon. Analysts here said embarking US jets was not just about saving British blushes due to lack of aircraft, but it had a wider operational benefit as well. "Embarking USMC F-35s does get the UK out of an embarrassing position of having a lot of floating real estate with very little to go on it. But it’s convenient for both sides and there is operational utility in such a policy," said Doug Barrie, the senior air analyst at the International Institute for Strategic Studies think tank in London. "Discussions are ongoing about the Marine Corps embarking in the future, including looking at policy-level decisions, rules of engagement, weaponry coming onboard, how many aircraft, and when, but there have been no decisions made and of course the American’s have to agree to all this," Kyd said. The British plan to operate the two carriers but not at the same time. "Having the two carriers allows us to continuously run one at high readiness, and the planning assumption is the second carrier will be at a slightly lower readiness," Kyd said. 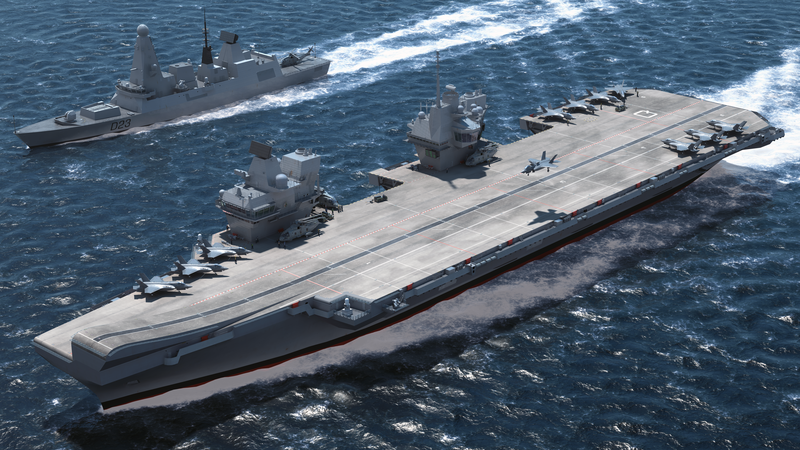 The base design of the carrier is for a force of 36 jets and four helicopters, but Kyd reckoned the number of jets could eventually be nearly doubled if required. Embarking USMC air assets onboard the Queen Elizabeth would bring benefits other than F-35 interoperability; it would also give Royal Navy capability planners an opportunity to get a close look at the V-22. Kyd said the expectation was the tilt-rotor aircraft will always be part of any package USMC deploys to the British carriers. Some in the British military have cast an envious eye at the capabilities the V-22 offers for sometime. And while there is unlikely to be funds available for a purchase any time soon, it didn’t stop Kyd including the tilt-wing aircraft in a slideshow illustrating carrier strike group elements and enablers. The British are using the Merlin and Chinook for initial logistics sustainment of the carrier, but the V-22 could be one of the longer-term options. Kyd, though, played up the multi-role capabilities of the aircraft rather than just make the case for a fixed wing carrier onboard delivery platform. "For me, as an operator, the V-22 is a fantastic piece of kit, a big footprint but big capability, too. It's not just about lifting troops in and out, it’s about bringing stores out to the ship. It’s quick, it’s also discreet for insertion of special forces or Royal Marine raiding parties," he said. As a naval officer, Kyd said the V-22’s most important role would be its ability to provide air-to-air refueling. "That’s really attractive to me. It extends the range and makes my deck cycle time that much easier. V-22 for me would be Christmas, although its expensive," he said. "...HMS Queen Elizabeth sailed from Portsmouth today to begin the second phase of her sea trials. She will be at sea off the coast of the UK for about a month while undertaking further testing. 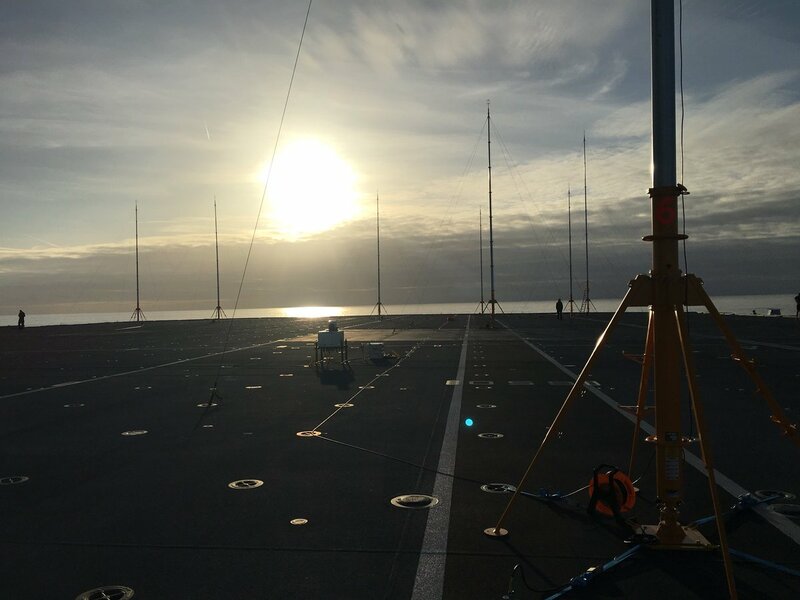 Nearly 11 weeks after her first arrival in Portsmouth on 16th August, HMS Queen Elizabeth is ready to begin part 2 sea trials which will mainly focus on mission systems, radars, communications, and electronics. In preparation for full-scale flying trials next year, the ship will also conduct air flow pattern tests, which demonstrate how air across the flight deck will affect aircraft taking off and landing. Apart from a pair of additional flight deck information displays, there are few external clues to considerable engineering work that has been going on below decks in the last 3 months. Teams of Aircraft Carrier Alliance engineers, some brought in from Rosyth, together with Portsmouth-based staff have been at work fine-tuning the ship’s machinery and completing fitting out tasks. She has not yet been fitted with her Phalanx close-in weapon system or 30mm cannons, which will be added in 2018, along with equipment to support F-35 operations such as the Instrument Carrier Landing System (ICLS)...."
CVF 'Drop Line' for Line up on the centerline at a distance (in the gloom it glows) and it is lit up at night for reference. 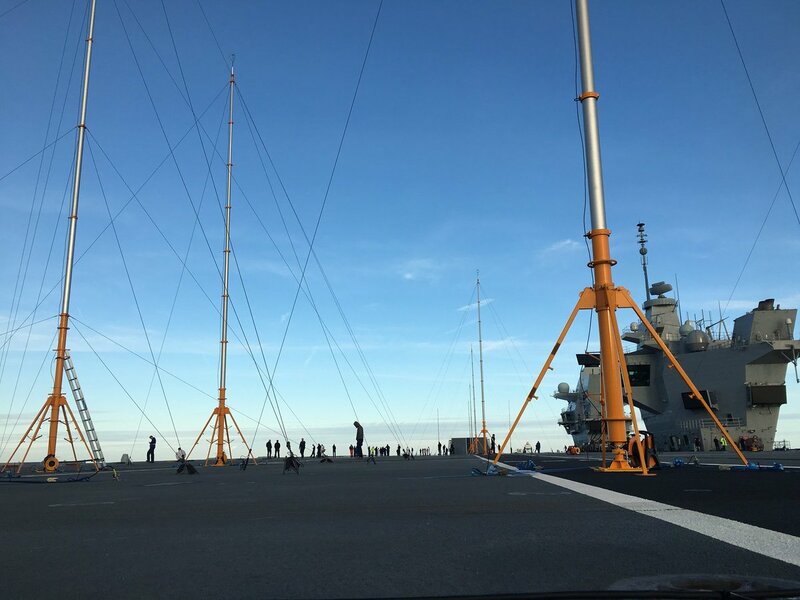 "...The carrier is currently making great progress through her sea trials and will return to her home port in Portsmouth in a few weeks’ time. Her Majesty the Queen will then visit the ship in Portsmouth on 7 December for the formal commissioning ceremony. Her Majesty will be joined by a host of dignitaries from the Royal Family, Government and the military, before saying a few words as Lady Sponsor. The commissioning warrant will then be read and the White Ensign raised, symbolising the acceptance of HMS Queen Elizabeth into Her Majesty’s fleet. It will be the first time Her Majesty the Queen has visited the UK’s new flagship since she formally named her in Rosyth, Scotland in July 2014. Since then the ship has been completed, sailed into her home dock of Portsmouth for the first time and is now continuing her sea trials. Her identical sister ship, HMS Prince of Wales, has also been formally named and is now structurally complete...."
Supercarrier HMS Queen Elizabeth recently arrived back home after a “successful” second phase of sea trials. "LONDON—Britain appears to be scaling back its F-35 ambitions as officials reassess the country’s defense plans. The 2015 Strategic Defense and Security Review (SDSR) reconfirmed the UK’s commitment to its full complement of 138 F-35s over the lifetime of the Joint Strike Fighter program. But now, just two years on, the language of defense chiefs is changing. For now, it seems the F-35 fleet will be focused on the UK’s carrier strike capability, with the formation of two frontline squadrons of 12 aircraft and an operational conversion unit for training. “For carrier strike to be viable the carrier should operate two squadrons,” Poffley said. The first of Britain’s new aircraft carriers, on which the F-35 will embark, is due to be commissioned by the queen into Royal Navy service on Dec. 7."